Tune in today for the second half of Doug’s interview with Andy McFarland. If you missed part one of this awesome interview with one of the the industries best, make sure to listen to part 1 right here. : Welcome to Spouses Flipping Houses, Episode 35. This is the summer edition. : We are Doug and Andrea’s kids, and we have officially taken over their podcast. : Our mom and dad are busy packing for the trip we’re leaving on today, so we thought we’d pitch in and help them out with their to-do list. : We looked through the list, and most of it was no fun. Stuff like laundry, vacuuming out the car, checking with employees, boring! But record podcast intro, that sounded like fun. : So what do they normally talk about anyways? : Hm, I’m not really sure. I don’t listen. : I know. They talk about houses. : That is so boring. : Well, we have the mics, so we can talk about whatever we want. : That’s even more boring. : No way, but maybe we should just introduce what this podcast episode is actually about. : Okay everyone, sit back, relax, and get ready to here the rest of our parent’s interview with the one and only Mr. Andy McFarland. : Do you even know who he is? : No, not really. But mom and dad think he’s pretty cool. : Oh okay, this podcasting thing is pretty easy. Doug: Okay, you make it sound so easy though, like build rapport, and you know. First of all, I love the point you made about genuinely caring about the person. And we take that approach as well, and I think that’s huge. That’s why I really respect your approach. We’re not going here to steal a property from anyone. We’re here to see if we can help solve a problem that you’re having. And usually if they’re contacting you from whatever marketing, there’s something going on. It’s either the house; it’s finances; it’s family; it’s health; it’s something. There’s something that’s driving them to need to sell this property quickly, so you’re trying to dig that out of them. But how do you build rapport? Because people might be listening thinking, sure that sounds easy to you, but I’m nervous as heck to go in there. People are on their guard and you know, so what are some tips, real tips, on how you would do that? Andy: Yeah, I like to go to their house. I think rapport starts on the phone but getting that in person with someone it’s easier to build rapport. You can look at them; you can smile; you can sense their body language; you can sense how they’re reacting to you. So I like to go in person with somebody. Truly care about that person. Knowing in your head that it starts with that mentality, and if you go in there like that, you need to truly care about them. Because if you don’t, check yourself first. If you don’t care, it’s going to be hard for you to do these other things. But if you do care, all of these other things we’re going to talk about will come naturally to you. Go in there, care about the person. If you find yourself in that appointment talking more than you’re listening, you’re doing something wrong. So go in there and listen more than you talk. Remember you’re given two ears and one mouth, so use them accordingly. Listen twice as much as you talk and if the conversation is stale and not going anywhere, then you can remember an acronym for that. I’ve taught this before, friends— or family, right— so ford. F-O-R-D.
F is for family, so you can start talking with somebody about their family. Wife, kids, whatever it is, ask about their family. If you see them kind of light up, it’s something they’re interested in and want to talk about. If they just are short and don’t really want to talk about it, that’s okay. Some people don’t necessarily want to talk about that, so you can move on to the next one. O is occupation. A lot of people want to talk about what they do, what their job is. So ask about their occupation. If they light up, if they like it, if it’s interesting, keep asking follow up questions. If they don’t light up with that, you can go on to the next one. R, recreation. What’s the recreation? What do they like to do for fun? So again, see are they lighting up with this. I like to ride motorcycles; I like to go canoeing, whatever it is they like to do. If they light up, ask them about it and don’t just ask them what they like to do and move to the next question. If they say they like something, ask a follow-up question, ask a follow-up question, ask a follow-up question. For me, I’m truly interested. I want to know if someone says they’re interested in scuba diving and they just got back from Cozumel, I want to know. Tell me about it. How’d you learn how to scuba dive? Where are the dives you’ve been on? I’m going to ask all of these follow-up questions that’s going to get them talking. And number four is dreams. What do they want to do? What’s their aspiration in life? You talk about people’s dreams. Some people have these dreams of being a rock star or whatever it is they want to do. Talk about their dreams. So whatever they light up about, go there with them and keep asking follow-up questions. And what you’re going to find is once you find those things and they light up and tell you about that, and you listen to them and are actively listening and asking follow-up questions, they’re going to tell that you really care about them. But at that point, you’re going to feel it. Once they’ve lit up and followed-up deeper, you’re going to feel in rapport. You’ll feel this just drop, this wall of strangerness will drop, and you’ll be their friend. So you go from being an unwelcome pest to a welcome guest in their house. And at that point, once you’re in rapport there, that guard has been dropped, at that point they will probably allow you to help them so you can shift the conversation to the house. But don’t just jump to what you want. Again, now they like you and they’re going to share the truth with you. So you can say, “Okay, tell me Doug, what’s going on with this situation? What would you like to see happen here?” And then I’m going to listen intently as to what they would like to see happen. Don’t assume it’s about money; don’t assume you know what it is they want. Listen to them and as soon as you listen to them, they’ll tell you all of the things they need for you to give them in order to get what you want— which is to purchase the property and ultimately help them. So I don’t go in there and say I have to do this. I go in there with that attitude of 1) I’m going to build rapport. 2) I’m going to listen to them and once they tell me what they need, I’m going to craft a solution that works for me that gives them what they need. And at the end of all that, we’re going to be friends. “Great. Will you please trust me with this business, and sign the contract, and let me take care of you.” They’re going to sign the contract. Doug: That’s awesome because you know, the first thing you’d think of is, “Okay, what’s wrong with the house? How many bedrooms, bathrooms, square footage? What price do you want?” And honestly, a lot of the people out there, that’s all they’re doing. There’s no rapport building. They’re going in; they’re finding out how low they can make an offer on that house. And the people are turned off by that. Andy: That’s a lot of my competition, and that was never my approach. And I would go into situations with multiple people that were vying for that business, and I would ultimately walk out with the business because I took the time to listen to them and give them what they needed, and I’m going to take care of them. And in my team I’ve tried to translate that to my team, and I’ve got some people on my team that are better at that than me, and some of them are at varying degrees. But we try and employ that same strategy across the board of we’re helping people. We have a Monday morning meeting with everybody on my team. We all get together and have a team huddle, and make sure we’re all on the same page, and share accountability numbers from last week. But we start that unintelligible , and we make sure it’s an important thing for us. We really want to make sure that we’re taking care of people, that we’re serving people. Like that’s an attitude that’s pervasive through the whole company. We’re not trying to take advantage of anybody. We’re trying to give guidance and help so that we can actually be of service and help other people. It’s not just lip service. We really want to do that. Doug: That’s awesome. That is a great way, a great culture you’ve built there that is centered around that service first, and treating people right, and you can feel good about yourself as a business owner, as a service provider to these people. So that’s fantastic. I’m sure, like us, if you determine hey man, you’re probably better off listing this property. If that’s the right situation for them, we recommend that. And then often times you might get a different answer, “Well, I really don’t want to do that because of this.” And now you’ve just discovered the reason. Andy: And I was never afraid to do that. I would bring up the things like “elephants in the room” that you think, well why would you tell them that? Don’t think they haven’t thought of that before. You can tell them. Now of course, you’re going to have to deal with it being more time, and you might have to clean it up a little bit and do some of these repairs we talked about. And you’re going to have to deal with inspections, and appraisals, and all of that stuff, but if you’re willing to do all of that and wait those three or four months, you’re going to make more money. So if that’s what you really want to do, if that’s what’s important to you, we can. And let’s run it down on this yellow pad. Here’s about how much more you’re going to make. What do you think? Doug: Yeah, you just helped eliminate those options if that’s not something they really want to deal with. Just by offering a help to them. Andy: But if it is, I’m fine with that. Doug: And if it is, great. You’ve helped them, yeah. That’s fantastic. Andy: And sometimes I’ll start the conversation with that too. I’d say I’m going to be like a real estate consultant. I’m going to tell you all of this stuff and at the end of the day, we’re going to leave as friends, and you’ve got a lot of good information. I’m going to do the best I can to help you however we can but if that doesn’t mean my services, then I’m going to point you in the right direction. So I try to start with that honesty and sincerity, so there’s guards down, and they’re not thinking, oh this guy is trying to give me the hard sell. I never was the hard sell with these guys. I just didn’t do that to people. Doug: Yeah, no that’s good, good stuff. So I’m going to shift gears a little bit. If you could go back 14 years, 13 years when you were kind of brand new in this business, would you change anything? What would you change? Andy: That’s a tough question because you know, if I changed anything I probably wouldn’t be… I’ve taken my perfect journey to where I am today, but some things that I could do to accelerate my progress would certainly be surrounding myself with people who are at a higher level than me or who were where I wanted to be at that time. If I’d have done that and as I started to do that in my life and business, and any aspect of my life but especially in business, I accelerated. My growth was accelerated to their level quicker by surrounding myself with them. So that’s probably one of the things I would do. I would go back and whisper in my ear, “Hey. Go find people who are where you want to be.” And what I thought was possible was my own limitation at the time, I remember thinking. Doug: Right, I know that guy. Andy: The glory years. But I thought, meh okay. And I smiled, and nodded, and whatever. It just, in my head, it was not even a possibility. Like I could not even conceive how it was all possible. But I’ve since surrounded myself, I mean years ago, with people who do those types of things and volume, and I can see who they are. And I know them, and they’re no different or smarter than me, and then I can see how it’s possible for them. I can follow the same blueprint. So that’s what I would do. I would surround myself with people who were where I wanted to be, push my own limiting beliefs. Doug: That’s good stuff. So this is the Spouses Flipping Houses podcast, so we have a lot of listeners that are spouses and not just that, but maybe they’re father-son, or they’re sisters, or brothers and working together in a partnership in some way with a loved one or family member. I think that you work with your brothers in some capacity. Is that correct? Andy: I do, yeah and my wife too. My wife, bless her soul, she cares but she doesn’t know where our houses are, what we’re doing. But it’s kind of a blessing for me that we can come and talk about other things besides that, but she’s fully supportive. But she just doesn’t need to know the addresses. She’s okay with that. But my brothers, yeah. I had a goal a few years ago before either of my brothers were working with me to work with my brothers. Family is important to me, and I wanted to be able to… When you work with people, you spend a lot of time with them. So my older brother, two years ago, was in a job he didn’t like. It’s been over two years now, two and a half years ago. He was in a job he didn’t like, and he wasn’t utilizing his unique ability, and he hated going to work everyday. And I didn’t get to see him a lot, and it was just— I wanted to work together using his strength, which is he’s an artist. He makes videos. So I started a video blog. It’s about my life as a real estate entrepreneur. I call it “I Love Real Estate Stories,” so that’s something we’ve been able to do together. He works with me in that capacity, and he also does some side work for the wholesale company. And anything video that we have, anything audio, he edits that, and he’s phenomenal at that. So that’s been great to work with him. I see him a lot. I work with him a lot. That’s my older brother, so awesome working with Jason. Me and my brother, and my parents, and my brother and sister were like, “Okay…” So he cut his long hair, his rock star dreams, and he joined the military. He joined the army. So five years later he came out, and I’m proud to say the army made a man out of him. It changed him, and he was always a good man, but he became a lot more responsible, and he learned a lot of things. He learned a lot about himself in those five years, but he came back out and saw what I was doing in real estate, and he thought, hey I want to do real estate. So nepotism did not get him the job, but it definitely got him the job interview. So my COO kind of brought him in and basically found a spot for him in the organization. And he’s flourished. He’s been great. He does our inside sales, for lack of a better term for it. He comps the properties in three states and just does a lot of stuff for us. So I get to work with him in that capacity, so he works in the wholesale company. He doesn’t report to me. He reports to other people in the company, which is awesome. Doug: So maybe you don’t work real closely alongside either one of them but if you do, how is that dynamic being brothers? And having all of this history and family, but you’re also in this business together where the ultimate goal is staying profitable and in business— is there a weird dynamic there at all? Or how does that go? Andy: Not at all. That would probably be a better question for them, but not at all. Doug: Maybe I should ask them that question. Andy: They’re big boys. They know what they need to do, and they take care of the business, and they work extremely hard. I don’t worry about any of them. Yeah, they work hard, and there’s none of that. There’s none of that. But it’s great. I get to see them and work with them a lot, and we have a lot in common of course because of our business life. As males, what you do is like 70 percent of your life. Andy: So we can relate on that level all of the time. Doug: Yeah that’s good. We sort of identify ourselves with our occupation and what we do. That’s just part of our DNA. So you mentioned, you kind of glossed over it, but I want you to talk about your “I Love Real Estate Stories” projects that you’re doing. Tell me about them. I’ve watched a few of them, but I’ll let you talk about them. It’s really cool stuff. Andy: Sure. It’s a YouTube channel, and I started it two, two and a half years ago with my older brother Jason. So we said we’re going to make videos of the life of a real estate entrepreneur and every aspect of that life. 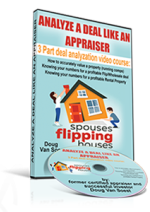 So whether it be a flip project or we buy, fix, and resell, kind of like an HGTV show, but we show you the real stuff, the real numbers. We include holding costs; we include the bad and ugly. It’s not fake TV drama. It’s real stuff. Wholesale deals I’ve done, I talk about those. I talk about walkthrough videos; I talk about staging; I talk about personnel issues; I talk about everything. Sometimes it’s like life and motivational stuff, but it’s whatever the flavor of that week is. Like this last week we had a Mastermind meeting with, Justin and I run a group called Seven Figure Flipping, so we did that Mastermind group. So this week’s video, which is coming out tomorrow, is about that. It’s about my life. Last week I spent three days locked down with a bunch of real estate entrepreneurs trying to push their business. So I’m going to share an eight or nine minute video, it’s a recap, of what happened there because that was my life this week. So that’s pretty much what it is. You can find it if you go to YouTube and type in “Andy McFarland” or you type in “I Love Real Estate Stories,” it should pop up. And I would love for people to go there and subscribe to the channel, and comment, or email me or whatever. But everything I do there is free. We actually do have some training videos that you can buy, but everything there is free. We love to have people consume our content and like it. And give Jason attaboys, my older brother, because he loves it when somebody comes and praises those videos because that’s his art. That’s his art. Doug: Yeah, I know you were trying to get a bunch of subscribers. I don’t know if you still have that goal or not but if anyone is listening, go become a subscriber and help them out. Check out the videos. They’re great stuff, very inspiring. In fact you just ran a marathon, which is cool. Doug: And there was a whole theme though, there was a whole message in that video of running this marathon that I really, really related to, and I really liked it. And one of the things I think you said in there. You were talking about how you didn’t know what shoes to buy. You’d never been a runner. You hated running your whole life. I’m talking for you, but you just had set this goal as more of a mental goal. You wanted to see if you could do it, run this marathon. Didn’t know anything about running shoes; didn’t know anything about training or what you’re supposed to do, or anything like that. But you just started doing it, and then as you were involved in this training process, you kind of learned what you didn’t know. You learned what questions to ask at that point, and I mean you can totally relate that to real estate. But I didn’t know, and the point is taking action leads you to the questions to ask. It was a good analogy. Doug: Yeah, and I just thought that was really good. Getting out there and doing it, and then just learn as you go. So speaking of real estate stories, do you have a favorite real estate story? Andy: Oh goodness. We’ve done probably 60 or 70 videos, or more, over the last two years. And some of them, there’s a lot of effort in each one of those even though people don’t necessarily see it. The running one was good. That was six months of my life that we packed into eight minutes. That was six months I’ve been tracking. I’ve been running, people that know behind the scenes, and then of course the marathon day. I did a video called “$187,651” or whatever, but that was the profit I made on one of these flip properties I did. Andy: And it was an amazing flip. We called it “Bedtime Stories,” so it’s an old one. People don’t really dig through your archives on your YouTube channel, but you go through there it was a year and a half or two years ago that we put it out. $187,000 whatever. It’s a cool transformation, amazing story of money making. And that one we actually made the video of me reading a bedtime story to my kids, which I do every night. So my kids are in the story. I’m reading them the story of this book of this house that I flipped, $187,000. And it was real, like it was a real video of me reading my kids this Shutterfly story of this rehab project I did. So that’s probably one of the highlight ones. Doug: Oh that’s cool. Didn’t you have recently a house that had a few snakes? Andy: Oh yeah. I had a rental house that had 55 snakes that the tenants had unintelligible. My acquisition manager almost got beat up by an old man with a cane. I’m sure that’s a story. There are so many stories every week. I mean the videos are quality. I’m patting myself on the back, but the stories are all real. It’s quality stuff, and it’s all free content. Doug: It’s never boring in this business. That’s for sure. There’s always something new that oh, I’ve never seen that before. That’s interesting. Andy: Oh my gosh. That’s why I had this idea. I was like, oh people are going to love to see the inside life of a real estate entrepreneur. The sellers that we see, you can’t make up these stories. Doug: You cannot make that up, yeah. Andy: They’re crazy. Some of these stories…it’s crazy. Man, yeah. So I thought I would tell a few stories. But I can only tell one percent of the stories, just because there are so many of them. But we pick and choose, okay this is the story we’re going to tell this week. Let’s tell this story. Doug: Okay, good stuff. Well you’re also an educator. You’ve got some stuff out there that you do. You teach. Tell me about if people want to learn from you, I know you’ve got a partner Justin, who we’ve also had on this podcast here. Tell us about what you guys do. Andy: Yeah, first of all let me say being an educator or a guru can have a bad connotation these days, “Oh the guru…” So I don’t like to see myself as that because it’s like throwing yourself into the sea of people. Doug: I didn’t say guru. I said educator, professor. Folks like that you have to navigate. She recently apologized to me actually though because she’s got a ton of valuable information? But yes, I am an educator with Justin Williams. He and I do this together. I used to do some educating on the side just as like private coaching stuff. I just don’t have the time to do all of that stuff anymore. I only do everything through what Justin and I do. Besides, “I Love Real Estate Stories,” you can go there and buy a few videos there, which are extremely high quality. Like the production value is amazing. They’re worth every penny. That’s not a sales pitch for those, but they’re worth every penny. So ILoveRealEstateStories.com/products, and I always tell people that if you don’t like that stuff, you can email me and I’ll give you all of your money back, and you keep the videos. I’ve never had anybody take me up on that. Like everybody who watches gets more value on that, so you can absolutely go do that. But yeah Justin and I have a thing called House Flipping Formula, which is basically people who want to get started in real estate. Learn at your own pace with some coaching calls and a private Facebook group. It’s amazing. It’s kind of our flagship program, so you can join that. House Flipping Formula. Doug: Now is that an online, like it’s all a web-based kind of thing? Andy: It’s all web-based, learn at your own pace weekly assignments with accountability and all of that stuff behind it. It’s great. For somebody who wants to get started, I would say push them right there. Go to that and you can learn how to get started. It’s all of the 101 stuff. Doug: That’s for the 101, the getting started stuff. And once they go through the 101, 201, House Flipping Formula, basically once they go through that program, we hope to elevate people through that. And we have elevated people through that to our high end Mastermind. It’s called Seven Figure Flipping. It’s for people that have already nailed their business. They’re making a good six-figure income flipping houses, or wholesaling houses, or doing rentals. And then they come, and we really just accelerate their business and take them to where they can do seven figures, because Justin and I both have seven-figure house flipping businesses. So we basically hold their hand and coach them through that, through our Mastermind process of other people going through the same journey, and we just really accelerate their business growth. Doug: Man, and that one is called Seven Figure Flipping? Andy: Seven Figure Flipping, yeah. 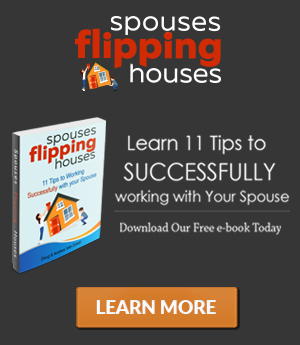 Doug: So House Flipping Formula and Seven Figure Flipping. You can Google those and find you guys, I think. Andy: Yeah I was going to say we have an event coming up in October in San Diego called Flip Hacking Live, my goodness. A lot of good people— I’m going to speak in there. Doug: Yeah, we’re speaking there. It’s either myself or Andrea, or both of us I don’t really know yet. But we’re speaking there as well, so I’m excited about that. Yeah, Flip Hacking Live. Andy: Awesome. So I’m going to be in San Diego for that, so anybody that’s coming out to that, it would be cool to meet you guys. But Doug is going to be speaking. Justin will be speaking, and we’ve got a bunch of Seven Figure Flipping students who are going to be speaking. And I can tell you that these guys are absolutely crushing and destroying their markets, and yeah it’s awesome to watch them. So they’re worth it. Doug: So that’s going to be a live event. If anyone wants to check that out, we have a link. It’s SpousesFlippingHouses.com/FlipHack, and you can sign up there and watch a video that I happen to be in. Andy: I’m in the video too. I didn’t know it until… Justin put me in the video. It’s pretty funny. Doug: You should go just watch the video. It’s entertaining just to watch the video. Andy: Seriously, just go watch that video because the video is awesome. Doug: The video is awesome. Andy: That’ll be fun. That’ll be cool just to go to San Diego and hang out, and do that. It’s always fun. Doug: Alright, so a couple more questions. Kind of on a more serious note, what’s the biggest mistake you see other beginning investors making? Andy: Oh goodness. Not learning from the experience of other people and not taking action fast enough. So through our educating, I see all types. And the people that I see who are the most successful are the ones that don’t over think it, and they just do. They just do what other successful people do. The ones that are less successful or not as successful as quickly are the ones that think too much about it, and they get in their own heads saying, Oh well I should I do this? What criteria are on this list? They just get in their own head about it, but the people who are just like go, go, go, implement, do, do, do. They just crush it. Doug: So not getting bogged down with all of the details and things that there are to think about and just getting bottlenecked in that. Instead, take what you know. Take action, then you’ll learn what the next question is and go from there. Andy: That’s it. That really is it. Doug: I don’t know what that is. I don’t know if it’s fear-based or what. What’s that phrase? Perfection is the enemy of progress, or something like that. Andy: Yeah that’s a great way to put it. I’ve heard it different ways, but it really is. For something to be perfect first, it’s never going to be perfect. Doug: It’s never going to be perfect. You’re never going to know all of it. Andy: I tell our students too that look at my business or might look up to me, or Justin, or what we’ve got built, and I say, “Guys it’s not perfect. It’s absolutely not perfect.” We deal with imperfection everyday in our business, and we just try to look at what’s the biggest problem now and try to make it better. That’s it. Everyday we try to get a little bit better in something, and it’s never going to be perfect. If you wait for it to be perfect, you won’t start. Doug: And then the last question is what’s you favorite thing about this business? Andy: I get to live my purpose and do what I want to do. The Seven Figure Flipping Mastermind event that we did last week was here in Utah and after three days, I got to listen to my team; I got to listen to Justin; I got to listen to everybody there. But I got a little bit emotional. I love talking to people, working with people, and helping people to push their real estate businesses. I’m so honored and blessed to be able to. Not only do I have my business doing that, but I can have the time to go and help other people do that, and fulfill their purpose, and help them grow. Pinch me, right. I’m thinking I would do it for free. I mean I don’t have the time to help everybody in the world, but I would do it for free. I’m living my dream right now, so I couldn’t ask for anything more than that. It’s been amazing. Doug: That’s awesome man. I’m really happy for you, and I can vouch that you’re one of the good guys out there in this business for sure. So if anyone wants to check out more about you, there’s “I Love Real Estate Stories,” you can do that. Is there any other way to see more about Andy McFarland? Andy: That’s probably the best way. If they come into our universe through House Flipping Formula or especially Seven Figure Flipping, they will get to know me very well. We will become friends. I am friends with every single person in that program for sure. They’ve been to my house. We hang out. We talk one-on-one. I know them; I know their kids; I know everything about them. But definitely come into my universe there, and “I Love Real Estate Stories.” I would love for you guys to come there, and comment, and let me know what you think. Every little bit helps. Doug: Yeah it is high quality. I really enjoy those videos, so go check them out. Andy: Cool, hope it helps. Doug: Well, cool man. Thanks for giving us your time! Appreciate it. We’ll talk to you again hopefully down the road here. Andy: Thanks for having me and thanks for doing this Spouses Flipping Houses so that you can influence other people in a positive way. That’s what you’re doing, and I appreciate that. Doug: Alright sounds good, take care Andy. Andrea: Wow, I hope you feel as inspired by Andy McFarland as I do. If you want to check out more of his stuff, head over to his YouTube channel, ILoveRealEstateStories.com, and you can find tons of great content there. Doug: It’s so hard to say. Flip Hacking Live. Andrea: Flip Hacking Live in October, you can head to our website at SpousesFlippingHouses.com/FlipHack. Doug: You know, we better watch it because we might be out of a job. Our kids did pretty good with that intro. Andrea: They sure did. That was fun. We just might have to put them to work again sometime this summer. Doug: Yeah, as long as they’re not having to go on payroll. Alright, so that’s it. We hope you guys have a great week. Andrea: Have a good week.